-Cash on delivery (COD) is available @Kota Bharu, Kelantan --as the item is pretty bulky. However, courier could be arranged. No worries! The Evenflo ExerSaucer Mega active Learning Center provides hours of activity for your little one while helping them grow, develop, and flourish. Evenflo has managed to improve upon the award-winning ExerSaucer with new features and accessories. The Evenflo ExerSaucer Mega active Learning Center is designed for education and entertainment. The assembly process is fairly involved, and you will need to set aside at least 30 minutes to get it all put together. I would recommend checking out Evenflo's website for video instructions for assembly, as the paper instructions that come with the ExerSaucer are not as intuitive as necessary. Once construction is complete, the ExerSaucer Mega becomes the ultimate activity center helping baby develop body and mind. Inside the Learning Center baby can bounce, rock, swivel, and spin. Made of durable, molded plastic, the learning center can be used indoors or outdoors. Three height positions allow the toy to grow with baby, and the seat locks in six positions to provide stability. 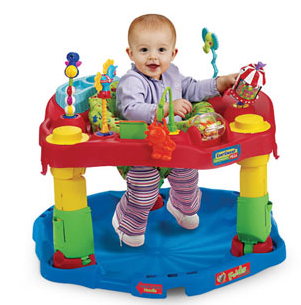 The ExerSaucer Mega active Learning Center's legs fold, and the built-in handle makes the ExerSaucer portable and compact. The seat pad is removable and washable, and the manufacturer recommended age is four months until walking age with a maximum height of 30 inches. Hi, mind asking if this item is still available?